French President François Mitterrand and German Chancellor Helmut Kohl in 1984 at Douaumont cemetery. The Battle of Verdun is considered by many the most blood-stained battlefield in world history. Never before or since has there been such a lengthy battle, involving so many men, situated on such a tiny piece of land. The battle, which lasted from 21 February 1916 until 19 December 1916 caused over an estimated 800,000 casualties (dead, wounded and missing). The battlefield was not even a square ten kilometers. On September 25, 1984, 70 years after the start of the First World War, German Chancellor Helmut Kohl met the French president François Mitterrand at the Douaumont cemetery in Verdun. The men stood in long, dark coats, without an umbrella. 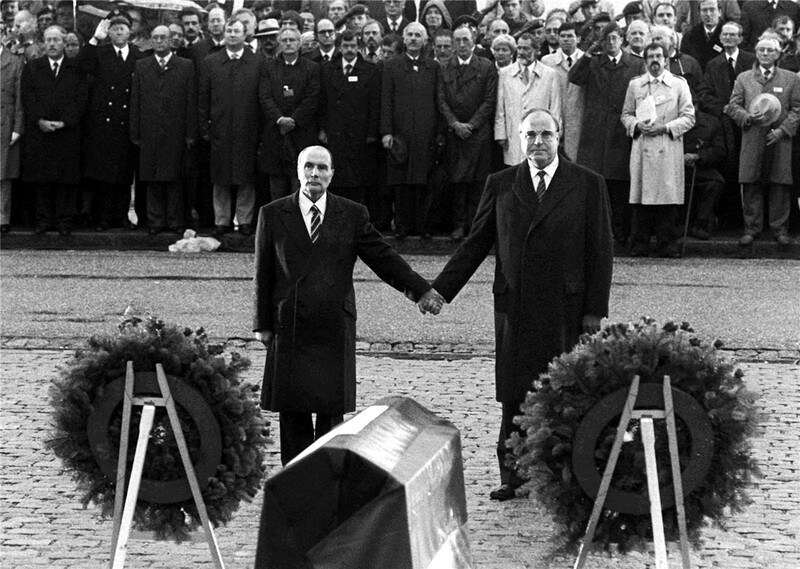 Mitterrand extended a hand to Kohl – a gesture of friendship symbolizing the lessons learned from a frightful past. Both heads of state were silent. They firmly held onto each other’s hands, for several minutes. The German Press described the scene as “a picture that will go down in history”. It was a sign, above all, for the war torn generation that the longstanding enmity between the Germans and the French has finally come to an end. This gesture was made more powerful by the fact that Mitterrand had been injured in the Second World War in Verdun and captured by German soldiers and Kohl’s father had fought in the First World War in the surrounding hills. 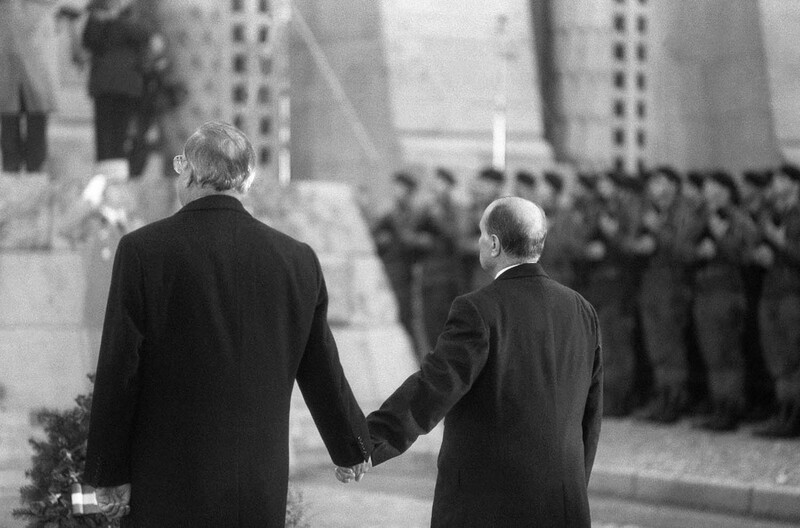 As the national anthems of both countries played, Mitterand and Kohl joined hands – a gesture of friendship symbolizing the lessons learned from a frightful past. 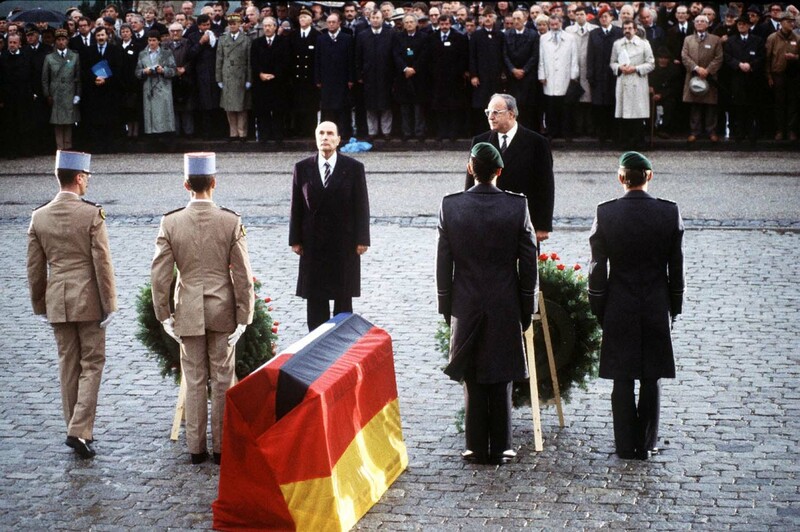 Helmut Kohl and François Mitterrand before the catafalque, covered on one side with a German flag and the other with a French flag. The Battle of Verdun started on February 21st 1916 and ended on December 16th 1916. With duration of 303 days it is the longest battle in human history. Although the exact casualty figure of the battle varies considerably according to sources, it is estimated that the casualties for both sides totaled between 700,000 and 800,000. With an estimated total casualty figure of 1.25 million, it was one of the most costly battles of World War I. Despite the Germans’ plan to “bleed France white”, the Battle of Verdun resulted in roughly equal casualties on each side. Since artillery blasts buried many of the fallen or rendered their remains unidentifiable, most of the recovered bodies have since been placed in the Douaumont Ossuary, a sobering memorial that contains the mixed bones of at least 130,000 French and German soldiers.